The Tibetan Centre is hosting the 6th visit of this Nobel Peace Prize winner. To handle the big events, this institution founded the Tibetisches Zentrum Event gGmbH in 2006. The Event gGmbH is a non-profit limited liability organisation. It organised the big seven day visit of the Dalai Lama in 2007 in Hamburg and the International Mindful Congress in 2011 in cooperation with Hamburg University. Tibetisches Zentrum Event gGmbH is non-commercial and functions only to cover costs. Since there are virtually no financial reserves, the event costs have to be covered by ticket sales and donations. The donations also serve to maintain moderately priced event tickets and an allotment of considerable price reduction of entry tickets for the ordained monks and nuns. As profit is not our aim, if a surplus results due to, for example, volunteers taking over important work, it will be donated for charitable purposes with H.H. the Dalai Lama's prior consent. 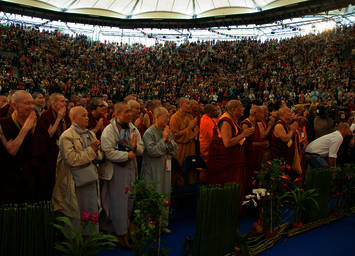 10,000 people came to Hamburg-Rothenbaum in 2007 to see the Dalai Lama. For the weekend venue "Learning Peace", the Nobel Peace Prize winner dialogued with experts from cultural, religious, scientific and economic backgrounds. The following five days, H.H. held sessions on Buddhist philosophy and religion. 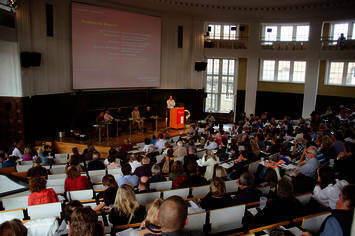 The Tibetan Centre organised a Mindfulness Congress in cooperation with the Hamburg University in 2011. About 30 speakers gathered together for four days to discuss mindfulness in Buddhism, in pedagogy and psychotherapy.